Scholastica announces a week of OA resources! Amid the daily hubbub, we don’t always get the opportunity to have deep discussions about all of the information swirling around concerning the present and future state of OA. OA Week is a time to come together to do so, and this year’s theme, “open in order to…” is a great place to start. In celebration of OA Week, and to help facilitate discussions surrounding OA, we’ve put together a list of our top 7 OA Resources. Throughout the week, we’ll be sharing an OA resource of the day via social media. We’ll also be sharing resources others are talking about and taking part in the conversation. 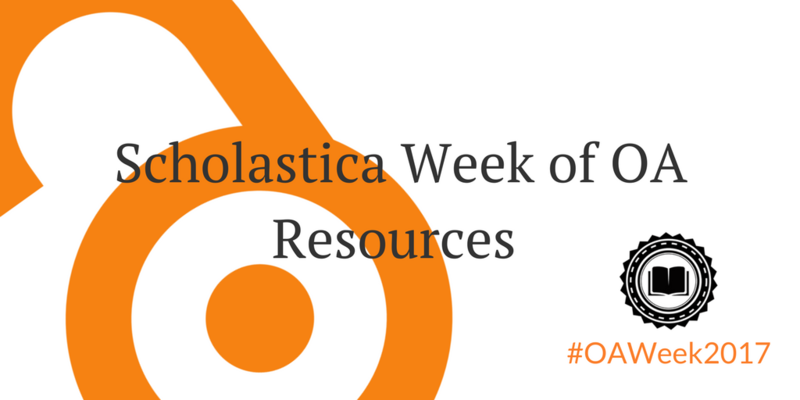 Without further ado, here’s our week’s worth of OA resources! We’re kicking off our week of OA resources with our recent white paper, “Democratizing Academic Journals: Technology, Services, and Open Access.” Featuring insights from 5 OA experts and advocates, the paper overviews how centralization of the academic journal publishing industry led to the serials crisis and why democratizing the tools and services needed to publish journals is the key to fixing it. In a follow-up webinar, “OA Advocates Weigh in on Democratization of Academic Journals,” the white paper contributors discuss their individual thoughts on the topics covered in the paper. We hope this white paper and webinar will help foster discussion around this year’s OA Week theme, “open in order to…”, by highlighting some of the primary benefits of pursuing sustainable academic-led OA initiatives including to give academics back control of research copyright, funding, and distribution, among other key factors. In honor of OA Week 2015, Scholastica featured “The Open Access Stories,” a series of interviews with OA supporters on how they’re working to further OA and why. The series includes interviews with prominent OA advocates including Stevan Harnad, one of the founders of the OA movement, and Alexander Grossmann, Co-Founder of ScienceOpen, as well as scholars who’ve started and are working on OA journals. As you consider the reasons to support making research OA this week, you may also be thinking about how you can get involved in the movement. One way many scholars are helping to increase access to research is starting OA journals in underrepresented research areas in their fields. If you’re interested in learning more about how to get a new journal off the ground, The Open Access Journal Starter Kit is a great first stop. This free eBook covers how to start an OA journal, cultivate a readership, and attract submissions. If you’re considering starting an OA journal or working with a newer journal that’s still getting its footing, you may also want to check out our free webinar “Inside the Editors’ Office: Launching a Sustainable OA Journal.” In this panel-style webinar, editors from two open access journals answer some of the most common questions new editors have about starting an OA journal and developing editorial and funding models to make it last. In discussions around starting OA journals and transitioning current journals to OA models, funding is inevitably a hot topic. There are many answers to the question, “how much does it cost to run an OA journal?” - because, the truth is, it all depends on how you do it. In “How to Publish Your OA Journal More Affordably: 4 Tips and Checklist“ we offer some quick tips to help journals publish on a budget. There are many approaches to OA for scholars to consider, from Green OA, in which a version of all articles is made freely available in a pre- or post-print archive, to Gold OA, in which research is freely available upon publication. Preprints, or manuscripts posted by scholars prior to formal publication, are one of the easiest ways for academics to make their research open from the start, and they even present the potential for new OA journal models. In “Open Access + Preprints: Journals and scholars take action,” a free eBook co-authored by Scholastica and Authorea, we cover how scholars are making their work OA faster via preprints and how some are even starting new OA journals with the help of preprint servers. There are many stakeholders that need to be involved in conversations about OA, librarians being chief among them. Rounding out our week of OA resources, we wanted to share “How Libraries Can Help Journals Cut Corporate Ties.” This blog post, which recaps Scholastica’s presentation at the 2017 LPForum, overviews ways university libraries can serve as a support system for scholars and not-for-profit institutions seeking to avoid or leave the corporate journal publishing model and why library involvement is so vital to the future of OA. In addition to our week of resources, this week we’ll also be sharing some OA publishing advice from editors we’ve spoken with throughout the years on how and why they publish OA. Additionally, Scholastica CEO and Co-Founder Brian Cody will present on DIY OA journal publishing as part of Helping Researchers Publish in Science, Technology, Engineering and Mathematics, a University of Cambridge OA Week event. Look out for these new resources! At Scholastica, our mission is to give editors the tools they need to easily manage and publish peer-reviewed journals at a price anyone can afford. A big part of that is helping to lower the barrier to entry to start and maintain OA journals. We’re thrilled to be a part of this OA Week and the greater OA movement and hope these resources will serve as tools and conversation starters that will extend beyond this week to aid you in current and future OA endeavors. If you're working on a new open access journal, one of the most important things you can do is seek the advice of editors who are a part of thriving OA publications. Here are a few tenets of successful OA publishing from 4 seasoned editors. Did you miss the live stream of Scholastica's webinar, OA Advocates Weigh in on the Democratization of Academic Journals? You can watch it on-demand!